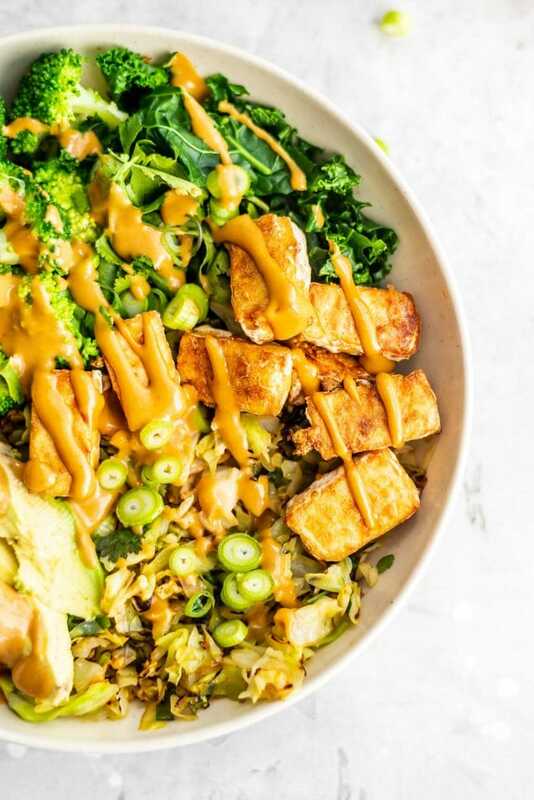 This low-carb vegan dinner bowl is made with a fun twist on traditional rice: cabbage rice! This gluten-free recipe is low in carbohydrates and contains a good amount of protein and healthy fats for a healthy, balanced vegan meal. Before we get into how to make cabbage rice…okay, so, cabbage rice isn’t really much like rice at all…lol. I’d say cauliflower rice is a much alternative to real rice. Cabbage is a little softer than cauliflower, so cabbage “rice” is really just finely chopped sautéed cabbage, but whatever, I’m calling it rice! It’s yummy, filling, easy to make, nutritious and I love it…that’s close enough, isn’t it? Cabbage rice couldn’t be easier to make. 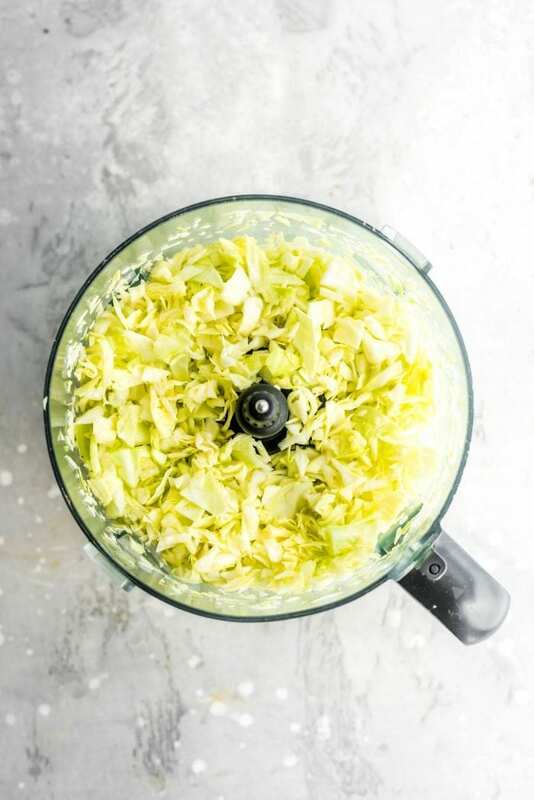 All you need to do is chop up some green cabbage, toss it in a food processor and pulse a couple times until you have a rice consistency. 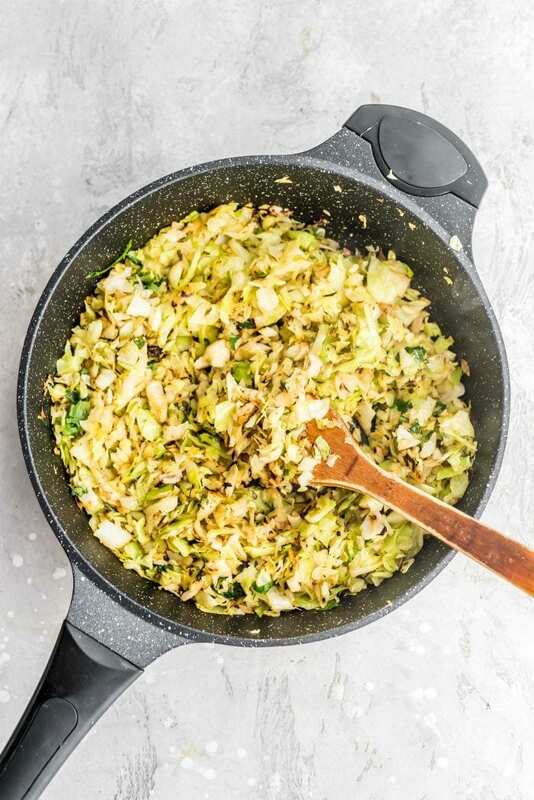 The riced cabbage can the be added to a large skillet and cooked for approximately 5-10 minutes until tender and starting to brown. I cooked mine in a bit of coconut oil, which is optional, and I added cilantro, green onion and garlic, again, optional. Sesame oil would be a good alternative to coconut oil to give it a fried rice flavour and other suitable additions would be a splash of soy sauce, pepper and garlic powder. There are many shortcuts to make baked tofu. I don’t always press and marinate it, so if you’re in a pinch, go ahead and toss the cubed tofu with the spices, soy sauce and arrowroot powder and bake away. Cut the tofu into approximately 1-thick slabs. Lay the slabs on a dish towel. Fold the dish towel over the slabs. Place a cutting board on the slabs. Place some heavy objects on top of the cutting. After you’ve pressed the tofu, cut into triangles or cubes, toss with garlic powder, soy sauce and either arrowroot powder or cornstarch and bake at 425 F for 15 minutes before flipping and baking another 10. I find baking it on parchment paper yields the best results. FYI…you can also buy a tofu press for extra easy tofu pressing! Why a Low-Carb Dinner Recipe? I hate labelling things low-carb, to be honest. I have no problem with healthy carbs and by no means, do I eat what’s considered to be a truly low-carb diet. Carbs are needed for all the activities we do and getting our carbs from whole food sources is a wonderful way to fuel our bodies. I do however, eat a very low-sugar diet and I like to get lot of my carbs from non-starchy veggies, which this recipe is perfect for. I also like creating recipes that work for all dietary needs and some of you like to keep your carbohydrates on the lower side. 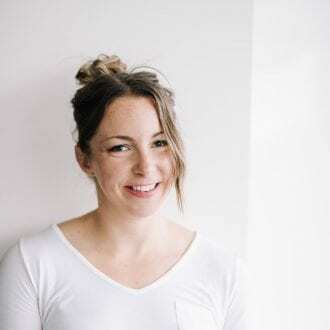 If you’d like a handy resource for determining the best vegan sources, of carbohydrates, fats and protein, click here for my free vegan macro cheat sheet. I also like to replace some of the grains in my diet with veggies. I still eat grains but I also like to experiment with veggie options such as cauliflower rice, zucchini noodles and now, cabbage rice! Yep, all the green stuff! These types of carbohydrates are low in sugar, high in fiber, full of nutrients and they make me feel great! This tasty, simple dinner bowl is low in carbohydrates, gluten-free, rich in healthy fats and full of nutrition. I hope you enjoy it! You can use cauliflower rice, broccoli rice, brown rice or quinoa instead of cabbage rice. You can use roasted or sautéed chopped cabbage instead of ricing it. Try adding hemp seeds of extra fat and protein. Feel free to adjust the amount of each ingredient to your taste preference or nutritional needs. Try it with marinated tempeh instead of tofu. 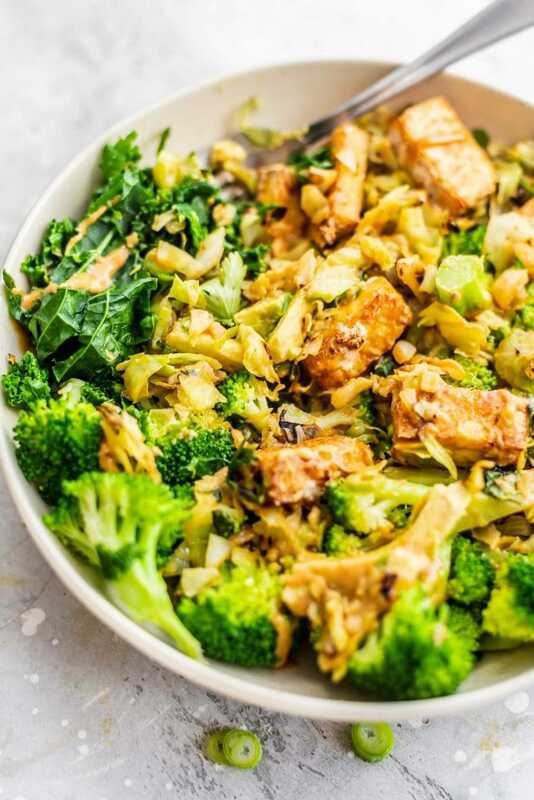 Try sesame oil as an alternative to coconut oil for cooking the cabbage rice. 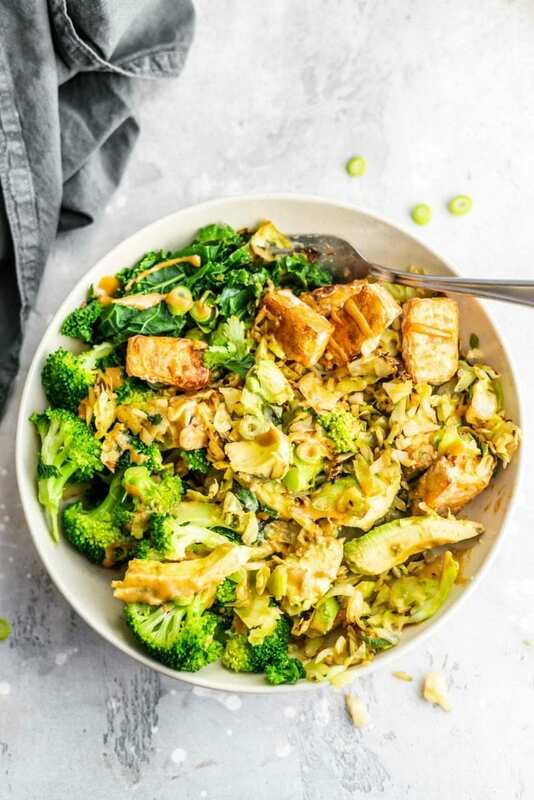 This Asian-inspired, low-carb vegan dinner options features a twist on traditional rice: cabbage rice! 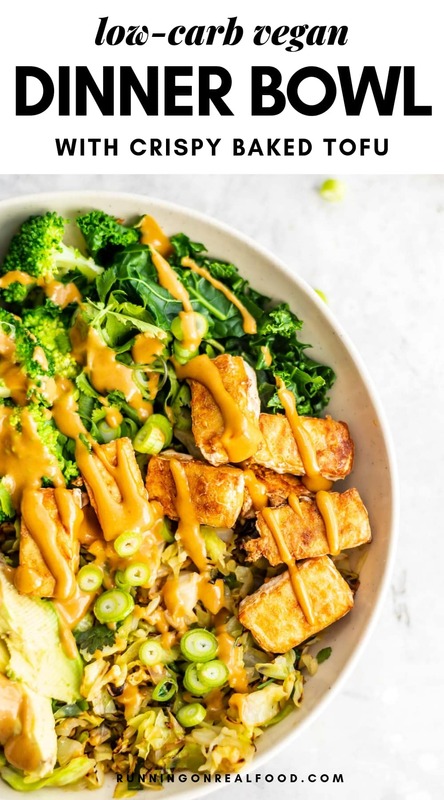 You’ll love the “fried” rice paired with avocado, broccoli, kale and a creamy almond butter sauce. Bake the tofu. Preheat the oven to 425 F. Cube the pressed tofu (see notes) and place in a bowl. 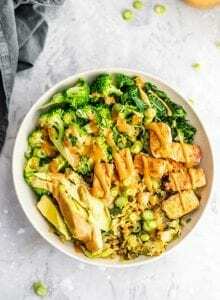 Mix with the rest of the tofu ingredients then place the pieces on a parchment paper or silicone mat-lined baking tray. Bake the tofu for 15-20 minutes, flip and bake another 10-20 minutes until it’s brown and puffy. Make the cabbage rice. 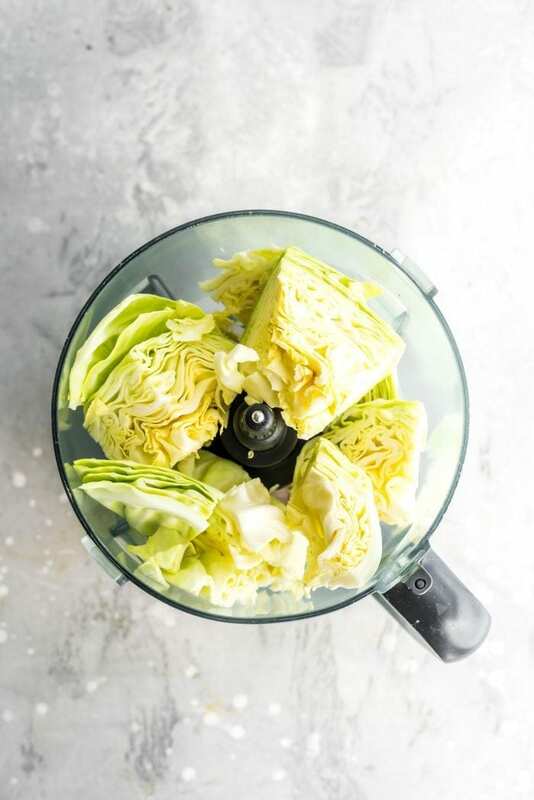 Remove the outer leaves of the cabbage, slice in half then chop into chunks. Add the chunks to a food processor and pulse a few times until the cabbage has the consistency of rice. Alternatively, you can just finely chop or shred the cabbage using a mandolin. 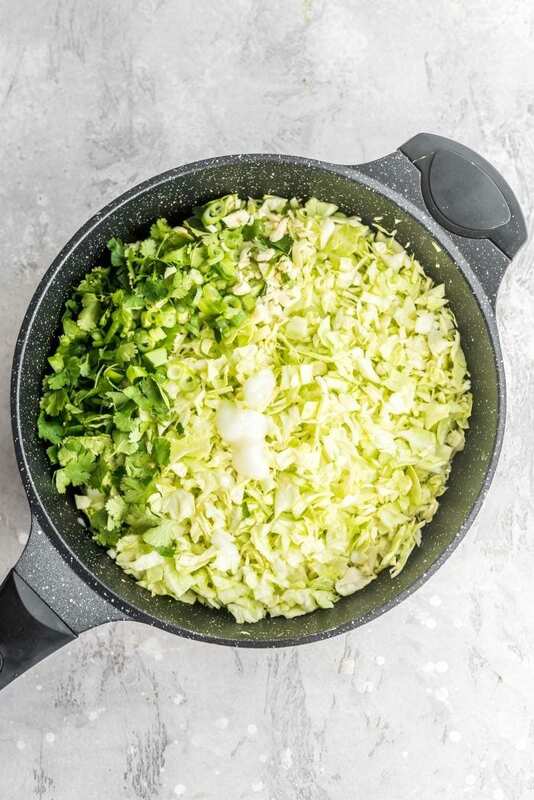 Add the “riced” cabbage to a large skillet with the rest of the cabbage rice ingredients and cook over high until until tender and brown, about 6-10 minutes. Mix it well to start, then only mix every couple minutes so it can start to brown on the bottom. Make the sauce. Whisk the sauce ingredients together in a bowl or container until smooth and creamy. Assemble the bowls. 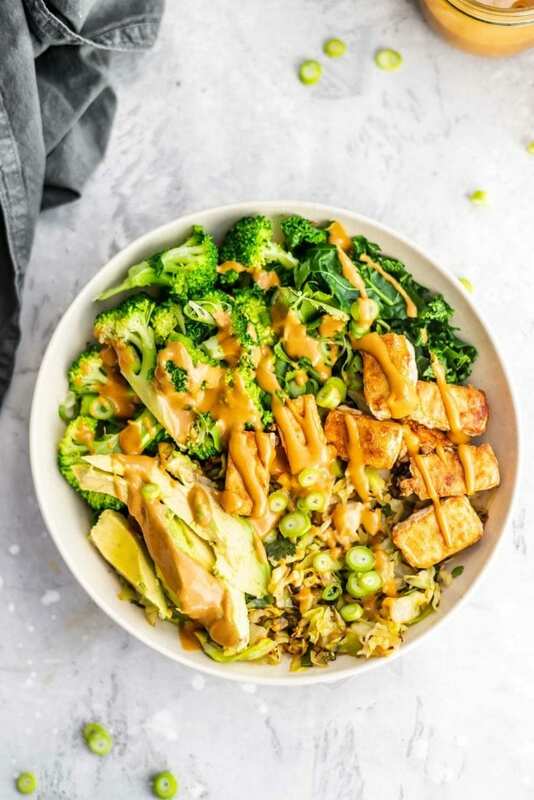 To assemble the bowls, start with a big scoop of cabbage rice then add the kale, broccoli, avocado and tofu, then top with the sauce. Leftovers can be packed up individually or assembled in containers, ready for your next meal. To press tofu, slice the tofu block into 3-4 slabs. Lay the slabs on a dishtowel on the counter top, then fold the towel over them. Place a cutting board or skillet on top of them along with a few heavy objects such as some cookbooks. Let sit for 15-30 minutes before proceeding with the recipe. You can also use a tofu press if you have one. Hi Deryn, I love your recipes! I’m just wondering if this meal is 30g of carbs total or per serving (I’m currently on a keto diet so I need to be mindful of my carb intake. It’s 30 grams of carbs per serving. Enjoy! This turned out amazing, I made a few modifications to stay within my carb limit and it was still fantastic! Awesome! So glad to hear the recipe worked out for you and you enjoyed it. Thanks for the comment!